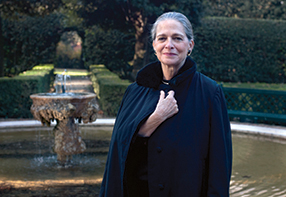 From 1988 to 2013, Adele Chatﬁeld-Taylor was president and CEO of the American Academy in Rome. During her tenure, she led the rebuilding of the institution and oversaw the renovation of the Mercedes and Sid R. Bass Garden, located behind the academy’s McKim, Mead & White headquarters building, and the redesign of the Secret Garden of the academy’s Villa Aurelia by Laurie Olin, Millicent Mercer Johnsen, and Alessandra Vinciguerra. She increased the academy’s endowment by nearly ten-fold and restored the number of Rome Prize fellowships to thirty. She supervised the restoration of the Arthur and Janet C. Ross Library and established an endowment for the Drue Heinz Librarian. For her contributions to the city of Rome, Adele was named a Grande Uﬃciale dell’Ordine al Merito by the president of the Republic of Italy in 2002. In 2007 she initiated the Rome Sustainable Food Project under the guidance of Alice Waters. In 2010 the National Building Museum awarded her the twelfth Vincent Scully Prize, which is granted for exemplary practice, scholarship, or criticism in architecture, historic preservation, and urban design.